4 pp. Roman, 185 pp. 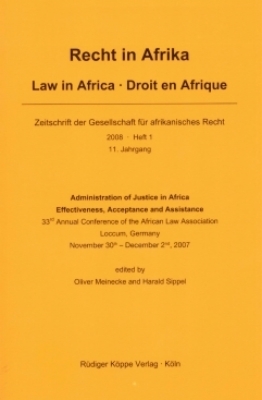 This special issue of the journal Law in Africa documents and complements a three day conference on Administration of Justice in Africa – Effectiveness, Acceptance and Assistance that took place in Rehburg-Loccum in the northern part of Germany in winter 2007. The conference was organised by the African Law Association in cooperation with and at the Protestant Academy Loccum. The African Law Association opted for the subject matter of the conference mainly for two reasons: on the one hand, the administration of justice plays a key role for the legal development of a country, but on the other hand, neither jurisprudence nor international development cooperation are paying sufficient attention to it. Therefore the objective was to organise a conference that would summarise existing knowledge of the field, formulate new –and old but unsolved – questions for future scientific projects and gives some useful insight for forthcoming programmes of development co-operation. The conference consisted of three sections and a panel discussion. All in all ten papers were presented by six scholars from African countries, namely Ethiopia, Ghana, Tanzania and Nigeria, and four German scholars. A closer look was taken on the administration of justice in select countries in East and West Africa (Ethiopia, Ghana, Liberia, Nigeria, Rwanda, Sudan, Tanzania and parts of francophone West Africa). In the first place issues of effectiveness of the administration of justice – of both state justice and the various traditional, religious and informal legal institutions of conflict resolution – were discussed. This led the participants to the second major aspect of the conference: the access to legal systems and the acceptance of justice. Finally the conference intended to take a look at the assistance of administration of justice by international development co-operation.